Following the battle off Negapatam, Hughes had spent two weeks at see before putting into Madras for repairs. There he was joined by Sceptre and San Carlos. Notified by one his scouts that the French were anchored outside Trincomalee, Hughes lifted anchor and made haste to come to the garrison's aid, but arrived one day too late. Suffren, now safe within the harbor, held council with his captains. Some of them, led by his second-in-command, had persistently opposed offensive actions against the British, and vigorously renewed their objections to the need for combat. Suffren, after confirming that his fleet outnumbered that of Hughes, argued in favor of action, as the destruction of the British fleet would greatly simplify land operations in pursuit of objectives of the French and their Mysorean allies. He accordingly gave orders to sail out and meet the British fleet. When they exited the harbor Suffren gave the signal to form the battle line. This command, even after being repeated several times, was poorly executed by his recalcitrant subordinates, and only a ragged line was arranged. Frustrated by this insubordination, Suffren then gave orders to hold fire until close quarters, and tried to communicate this by firing a gun from his flagship, Héros. 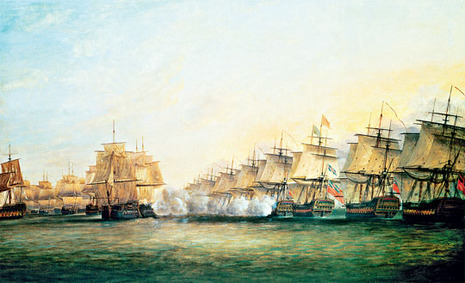 This shot was misinterpreted by his captains as an order to open fire, and the whole line opened fire on the British fleet, beginning the action. The heaviest action was at the center of the lines, where Suffren and Hughes again faced off against each other. Héros was assisted by Illustre and Ajax, while Hughes, leading from Superb, was assisted by Burford, Sultan, Eagle, Hero, and Monarca. This lopsided conflict went on for about one hour before Suffren signaled for assistance. St. Michel and Annibal, commanded by insubordinate captains, stayed away, while Brillant eventually neared the action and gave some assistance. Thirty minutes later Ajax was forced to withdraw with heavy damage, and was replaced by Artésien. An hour later the situation became critical when Héros' mainmast came crashing down, and Suffren was forced to scramble to make sure the British did not think that he had struck his colors. He had also run out of ammunition, having fired 1,800 rounds at the British ships, and continued to fire powder alone in an attempt to fool the enemy. Battle on the ends of the line went more in favor of the French. Isis, Worcester, and Monmouth were badly damaged, and Exeter, whose captain was killed in the action, was disabled. At 5:30 pm, after about three hours of battle, the winds suddenly shifted to the advantage of the French fleet. The ships on the outer ends of their line, which had seen relatively light action, were able to bear on the battle at the center, bringing a new intensity to the battle. Hero lost her mainmast and mizzenmast, and Worcester lost her main topmast. A number of British ships were disabled before night fell, and darkness ended the battle. The worldwide implications of the American War for Independence are made clear on this day in history as the American-allied French navy begins a 14-month-long series of five battles with the British navy in the Indian Ocean. Between February 17, 1782, and September 3, 1782, French Admiral Pierre Andre de Suffren de Saint-Tropez, otherwise known as Bailli de Suffren, and British Vice-Admiral Sir Edward Hughes, commander in chief in the East Indies, engaged in four major battles in the Indian Ocean region: the Battle of Sadras on February 17, the Battle of Providien on April 12, the Battle of Negapatam on July 6 and the Battle of Trincomalee on September 3. The French attacked British possessions on the Indian coast and in Ceylon as part of the world war spawned by the American Revolution. Although Suffren failed to take any of Hughes’ ships, he managed to prevent Hughes from taking any of his own fleet. This alone was a significant improvement in French performance when pitted against the legendary British navy. The fifth and final encounter of the two fleets—the Battle of Cuddalore on April 20, 1783--forced Hughes to leave for Madras, just before Suffren learned of the Treaty of Paris and returned to France. En route home at the Cape of Good Hope, Suffren received compliments on his strategy from the English captains he had opposed in East India. Napoleon, too, had a high opinion of Suffren, commenting that he would have become France’s Lord Nelson, had he survived. Instead, he died suddenly in France on December 8, 1788, of either a stroke or wounds from a duel. Hughes also profited from the East India campaign. He returned to Britain extremely wealthy from the various prizes and perquisites he won in the Indies and had his portrait painted in full naval splendor by the renowned Sir Joshua Reynolds.